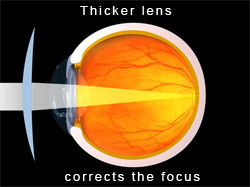 Young people with mild to moderate hyperopia are often able to see clearly because their natural lens can adjust, or accommodate to increase the eye’s focusing ability. However, as the eye gradually loses the ability to accommodate (beginning at about 40 years of age), blurred vision from hyperopia often becomes more apparent. The treatment for hyperopia depends on several factors such as the patient�s age, activities, and occupation. Young patients may or may not require glasses or contact lenses, depending on their ability to compensate for their farsightedness with accommodation. Glasses or contact lenses are required for older patients.